Hansen's 1988 predictions - 30 year anniversary. It is thirty years ago since James Hansen's famous Senate testimony on global warming. This has been marked by posts in Real Climate and WUWT (also here), and also ATTP, Stoat, Tamino. As you might expect, I have been arguing at WUWT. The more substantive discussion is on the accompanying 1988 prediction paper. This was a remarkable achievement, which used runs of an early GISS GCM to forecast temperatures for the next thirty years. These forecasts are now often checked against observations. I wrote about them here, here and here. Each post had an active plotter which allowed you to superimpose various observation data on Hansen's original model results. It's annual data, to match Hansen's prediction. Since sientists can't know how much carbon society will choose to burn, Hansen analysed three scenarios (A, B and C) which covered the range between no restraint and successful limiting. Arguments then ensue as to which scenario actually happened. At least, that is what people should argue about, although they have a tendency to drift off into "Hansen said..." or even orse "we were told...". Anyway, I'll leave discussion of that for the moment, and show the interactive plotter. The diagram in the background is Hansen's original plot, which is of anomalies relative to base years 1951-80, and uses GISS Ts as the observed data set (this had recently been published (Hansen and Lebedeff)). I have used that base where possible, else I match the dataset to GISS Ts over 1981-2010 (satellite data). Data is annual to end 2017. Sources are linked here. To operate, just choose datasets to plot using the radio buttons, and Clear All if you want to start again. You can't erase curves without restart. In interpreting these, I think weight should be given to GISS Ts, since it is what Hansen had available and used. Later indices incorporating SST rise more slowly. And I have reluctantly included troposphere data, which is definitely not what Hansen was predicting. Properly interpreted, I think the predictions are excellent. But that comes back to deciding which scenario is appropriate. I discussed this extensively here. We have detailed versions of the sequences of gas concentrations that quantified the scenarios, and while CO2 followed scenario B, others were much lower. CH4 and CFCs were below scenario C, so overall a result between B and C is to be expected. And that is what is mostly observed, though GISS Ts is higher. For the CFC plots; scenario C assumed that the Montreal agreements on curbing them, still being negotiated, would be approved and would work. A and B were more sceptical, but C was right. For methane, the concentration not only rose rather slowly, but was revised downward even before 1988. 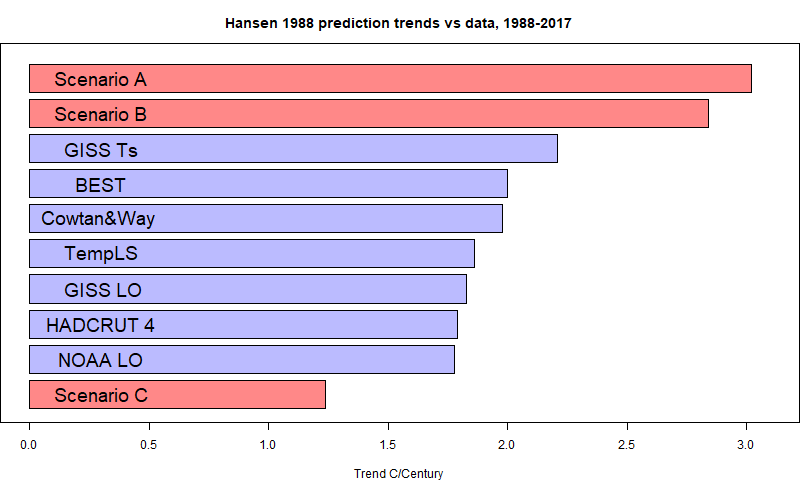 What the showing of combined temperature records shows is that Hansen's 1988 prediction is about as good as it could be, because it sits within the scatter of modern records. The difference between GISS Ts and GISS land/ocean is comparable to the difference between GISSlo and scenario B.
GISS May global down 0.03°C from April. The GISS land/ocean temperature anomaly fell 0.03°C last month. The May anomaly average was 0.82°C, down slightly from April 0.85°C. The GISS report notes that it is the fourth warmest May in the record. The decline is very like the 0.038°C fall, of TempLS Mesh, although the NCEP/NCAR index declined rather more. The overall pattern was similar to that in TempLS. Warm in most of N America, and equally warm in Europe, especially around the Baltic. Warm in East Asia, especially Siberia. Antarctica mostly warm. Still a pattern of warm patches along about 40°S. May global surface TempLS down 0.038 °C from April. 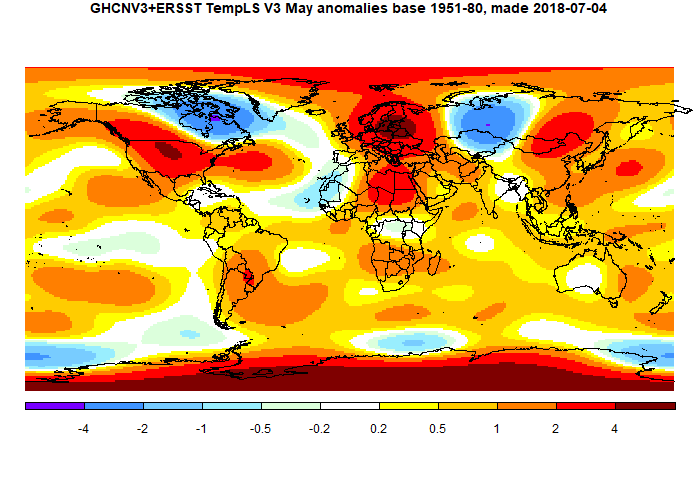 The TempLS mesh anomaly (1961-90 base) fell a little, from 0.716°C in April to 0.678°C in May. This is less than the 0.09°C fall in the NCEP/NCAR index, while the satellite TLT indices fell by a similar amount (UAH 0.03°C). It was very warm in much of N America, except NE Canada (cold), and very warm in Europe. Cold in E Siberia, but warm in East Asia generally. Again a pattern of warm blobs around 40-50 °S, though less marked than in recent months. Quite warm in Antarctica (relatively). Here is the temperature map. As always, there is a more detailed active sphere map here. Canada (late) did have a cooling effect. In the Moyhu NCEP/NCAR index, the monthly reanalysis anomaly average fell from 0.377°C in April to 0.287°C in May, 2018. This cancels out the last two months of increase, and matches the February average. It was for once warm in both in North America (except far N) and Europe especially Scandia. Russia was cold in the W, warm in the East. Nothing special at either pole. Probably the main contributor to the drop was a chill in the N Atlantic region, including Greenland. Active map here. I had thought that the gradual warming might be associated with the decline of La Niña. But the changes are small, so shouldn't be over-interpreted. The BoM still says that ENSO is neutral, and likely to stay so for a few months.